Over the years, the Circuit de la Sarthe has undergone a series of subtle changes, but has always managed to retain the same level of charm. It’s one of the few racing events left where drivers and teams don’t just compete against each other, but also the circuit. Even the addition of chicanes to slow the cars down and extra run-off areas has barely blunted the challenge. Here are 12 onboard videos showing how things have changed over the years, each one compelling in their own unique way. 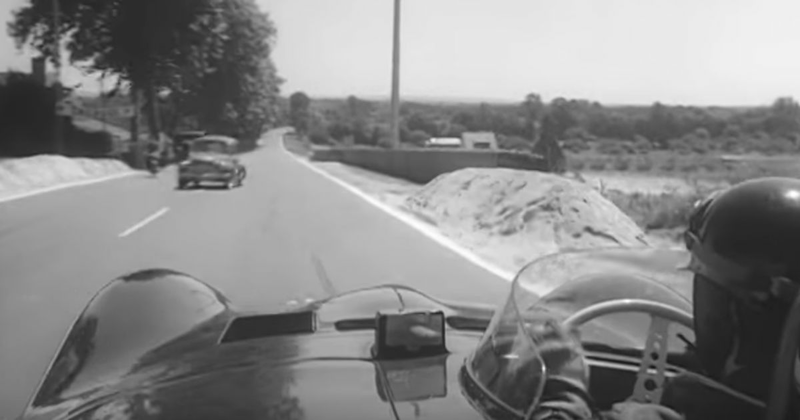 Here’s an amazing onboard of 1954 race winner and 1958 F1 champion Mike Hawthorn taking a Jaguar D-Type for a spin around the circuit. However, it’s a practice lap on a day where the rods are open to locals, so whilst he’s driving (one-handed - the other is holding the mic!) around at reasonable pace, he’s also avoiding other cars and cyclists. Fast forward a dozen years to this lap from the nose of a Ford GT40, narrated by Stirling Moss. The circuit looks basically the same, although that was the first year of the Ford Chicane at the end of the lap to slow cars down before the pit lane area. The scariest bit has to be the Maison Blanche (white house) kink just before the end of the lap, though. It was one of the most fearsome corners in motorsport until it was bypassed by the addition of the Porsche curves in 1972. Here’s Jurgen Barth hustling the Porsche 936/77 during practice for the 1977 race. He was meant to be racing alongside just Hurley Haywood but during the race, the pair were joined by Jacky Ickx, whose own car had broken down early on. This car had been struggling too, though, and was in 42nd place when Ickx joined. 13 hours later and after some incredible driving by all three - but mainly Ickx - they were in second, and by morning they’d taken the lead. But, with 45 minutes to go, the car stumbled into the pits with engine problems as an entire piston had broken. Luckily the lead was so big that they could afford to remain in the pits for half an hour and then cruise on around five cylinders for the final 10 minutes to take the flag and the win - still a staggering 11 laps in ahead of anyone else. Sunset at Le Mans is a glorious time to watch, although the setting sun can cause some visibility problems. That’s abundantly clear in this onboard of the Richard Lloyd Racing Porsche 956 in 1984, which was entered specifically to capture some onboard footage. Although it got these great sunset shots the car wasn’t around to get the sun coming back up again - the crew were disqualified for receiving illegal technical assistance. We can’t leave out a video of the glorious rotary sound of one of Mazda’s prototypes, can we? Here’s the 767B (predecessor to the 787B which won Le Mans in 1991) charging around in 1989, the final year before chicanes were installed on the Mulsanne. Incredibly, the sound isn’t the most impressive thing about this clip - that’d be the mega save coming out of Arnage. The greatest Le Mans qualifying lap ever? When heading out for his run in 1990, Mark Blundell and the team noticed a problem with the turbos. It was the good kind of problem though - instead of the normal 800bhp, the engine was now pumping out over 1100bhp. He was called into the pits for repairs but Blundell ignored it, unplugged his radio and went for it. The bonkers lap was six seconds quicker than anyone else could manage. It could have been even faster, too - he wasn’t even using qualifying tyres! Think helmet cams are a relatively new thing? Think again! Here’s a very early one courtesy of Andy Wallace as he laps Le Mans in the McLaren F1 in 1995. Driving with the father-son duo of Derek and Justin Bell, the trio almost took an emotional and popular victory before gear selection problems late on relegated them to third. Here’s a quick race lap with Christophe Bouchut in the Mercedes CLR. Yep, that’s the car that backflipped at high speed in the hands of Mark Webber (twice!) in the build-up to the race. TV cameras didn’t catch either of those incidents, but they did see the third one of Peter Dumbreck during the race, which takes place a few minutes after the onboard. Time to slow things down a bit. The brutal V8 sounds of Corvettes have been a mainstay at Le Mans for much of this century - and they’ve had plenty of success too, with eight class wins. This is from 2004 - a year in which Olivier Beretta, Oliver Gavin and Jan Magnussen gave the Corvette its third class win. Motorsport is all about hybrid tech now, but it wasn’t so long ago that diesel power was all the rage in LMP1 as Audi and Peugeot battled for supremacy. Here’s a lap from 2011 - Peugeot’s last year in the race to date. Yeah, diesel race cars still sound kinda weird. Time for some LMP2 action now as Oli Webb threads his way around a lap of Le Mans. There are some proper squeaky bum moments passing the GT cars coming through Tertre Rouge and onto the Mulsanne. Open-topped cars were phased out with the introduction of the new 2017 LMP2 rules, which is kind of a pity. What’s better than a Le Mans onboard? A Le Mans onboard at night. This is the one of the Porsche 919 Hybrid’s from the 2015 race (the year Nico Hulkenberg won) flying through the darkness and somehow navigating traffic. The really crazy thing, though, it how it goes through the Porsche Curves - it looks like it’s in fast-forward!